Are you one of those people who takes out the holiday decor the day after Thanksgiving? 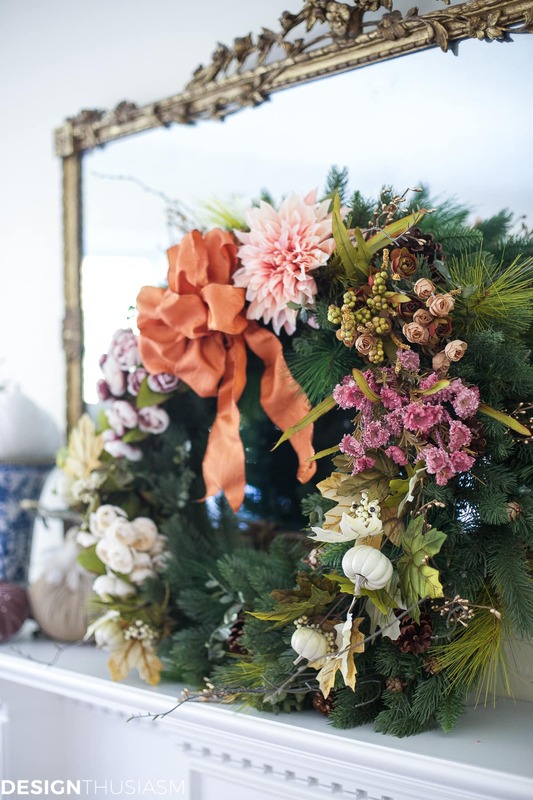 Have you ever packed away the fall wreath just in time to take out one for Christmas? Did you ever wonder why you don’t just use the same one? 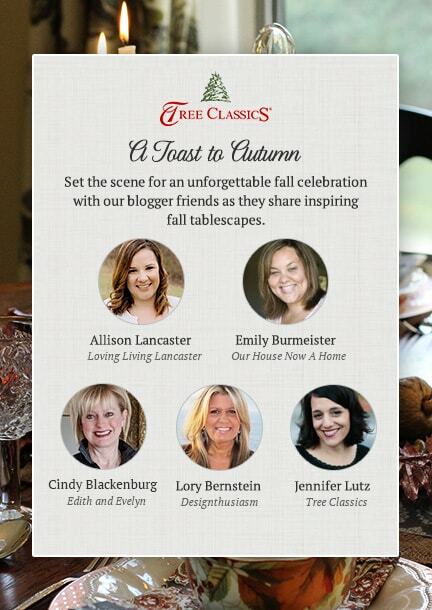 I’m delighted to be working with my sponsor Tree Classics on their fall celebration, “A Toast to Autumn”. They’ve provided a group of bloggers with a wreath and garland each, and challenged us to incorporate them into our fall decor. I knew this was going to be fun! 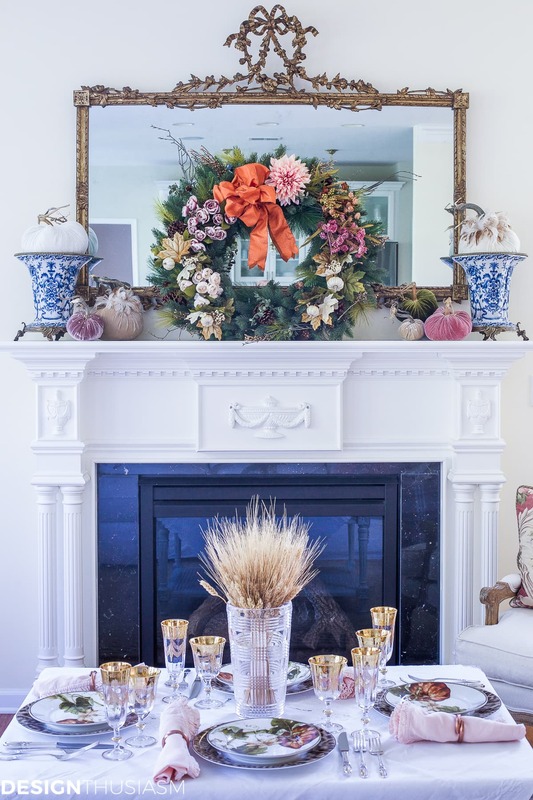 I decided to set a seasonal table on the coffee table by the fireplace, to fully appreciate the beauty of the wreath set up on the mantel. 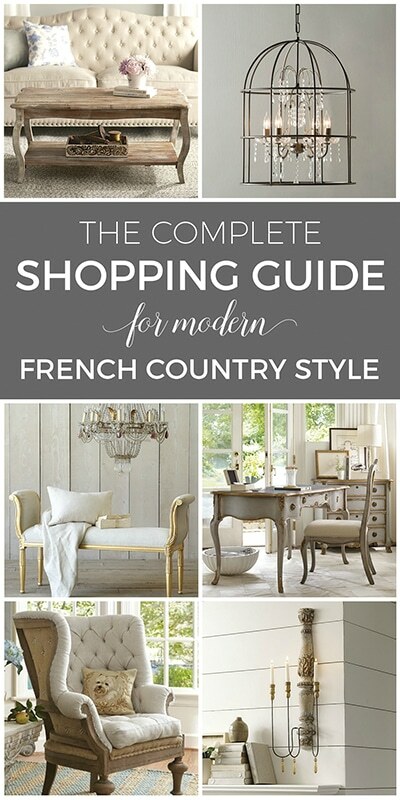 I chose colors that adhered to what has become my signature fall style, warm fall tones that are lightened for subtlety and infused with a bit of blush and rose for a feminine touch. 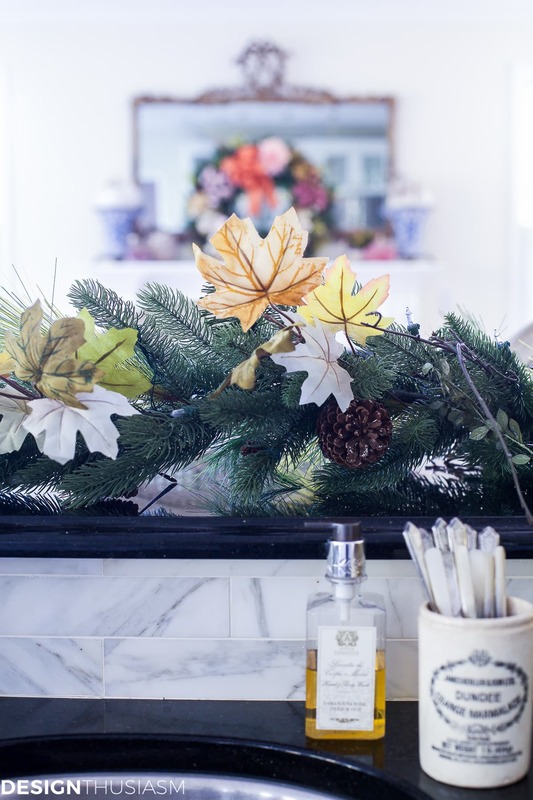 The garland I set on the bar counter between the kitchen and den, and tucked in bits of fall greenery, including leaves and berries in the same muted fall hues. The pine cones come as part of the garland and for the holiday season I’ll also use the lights that are laced into the branches. 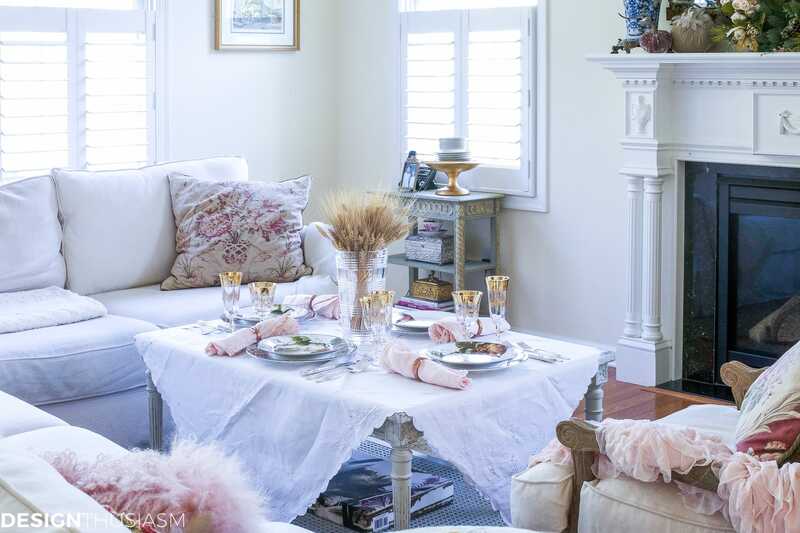 The cozy table setting in our family room is perfect for fall Sundays when friends or family come by. But of course my favorite part if this autumn challenge was decorating the beautiful wreath. I chose the Classic Fraser Fir in the 32” size and went to work adding flowers and ribbon that embodied my fall color story. The floral bunches are simply tucked in, even though I expected to have to wire them on. The wreath is so lush and full, that it was easy enough to just slip them in. 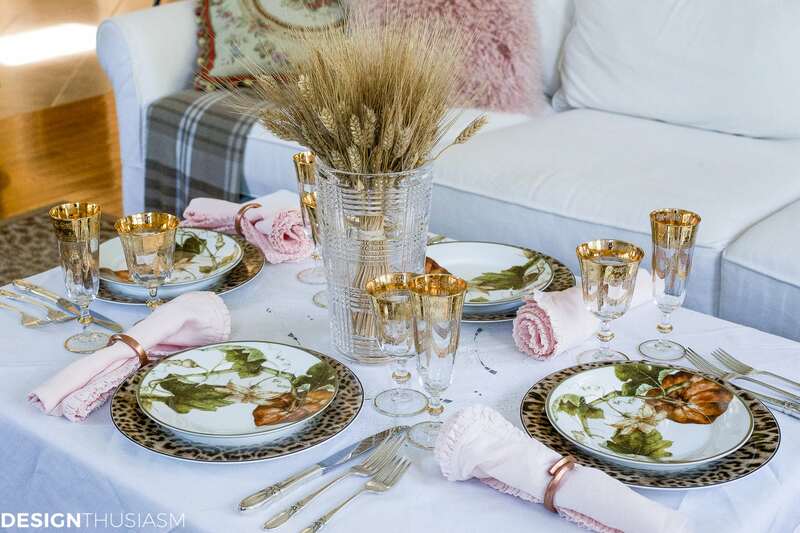 I love mixing patterns in my table settings and the rich colors in the wreath were strong enough to sit comfortably with the plates that I chose, a botanical pumpkin salad plate set against a cheetah print dinner plate. 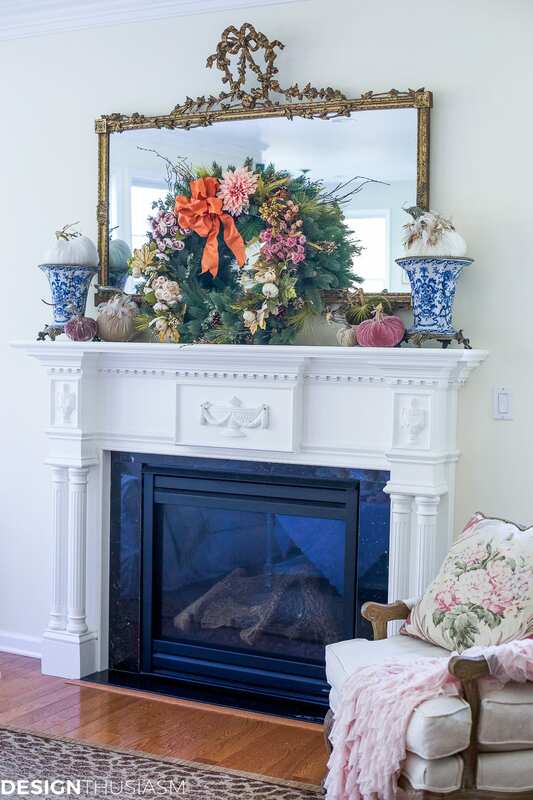 The mantel is peppered with velvet pumpkins in similar colors, but the adorned wreath really takes center stage. Pine cones and golden branches came as part of the wreath and work so well with the fall bits I added. 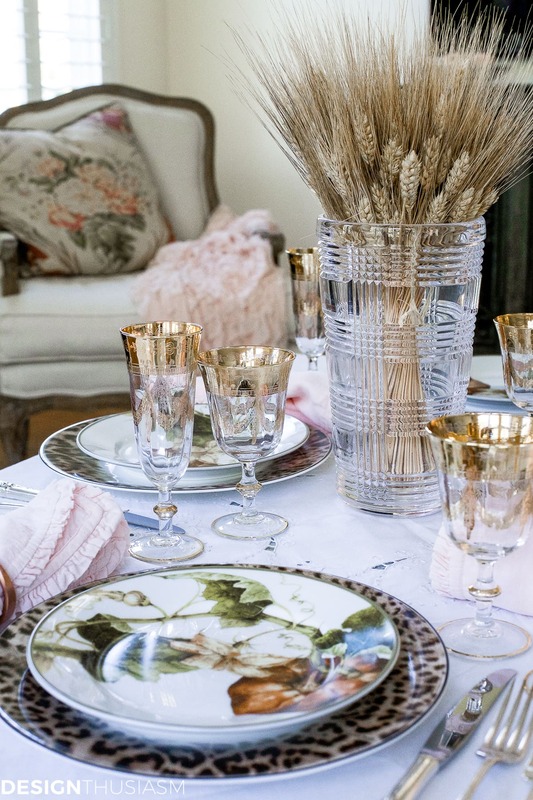 I kept the table centerpiece really simple, to avoid clashing with the florals in the wreath, so I went with simple dried wheat stalks, which bring out the lovely glow of the gilded goblets. The warmth of this room feels like the perfect reflection of the warm feeling that the autumn season brings. 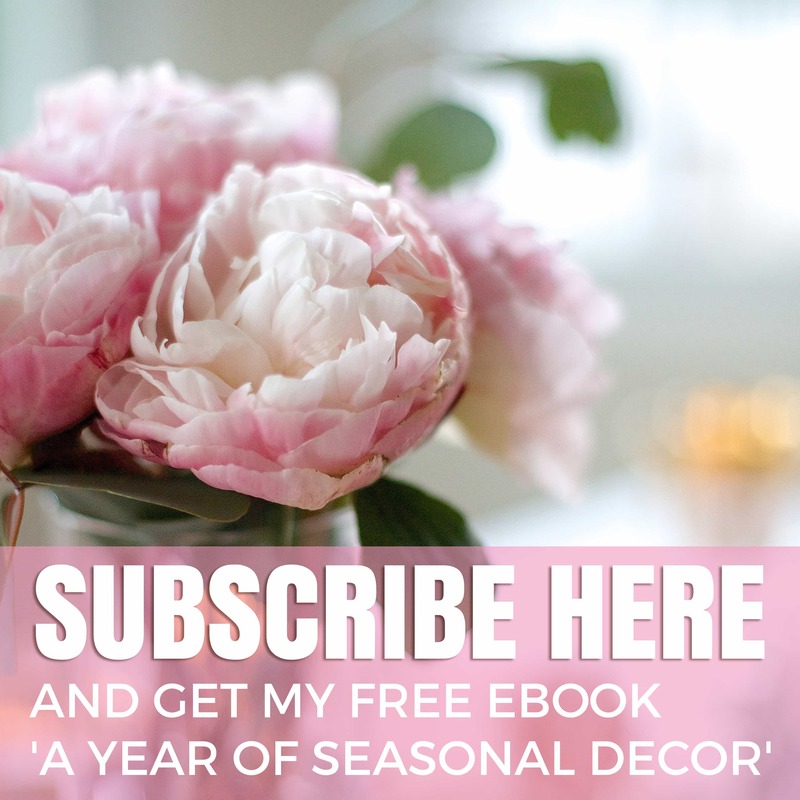 If you’d like to purchase a Tree Classics garland or wreath, they have generously offered my readers “A Toast to Autumn” 10% discount! Please use the code ATTA2017 to receive your discount and note the offer is valid from 10/02/17 to 10/13/17. 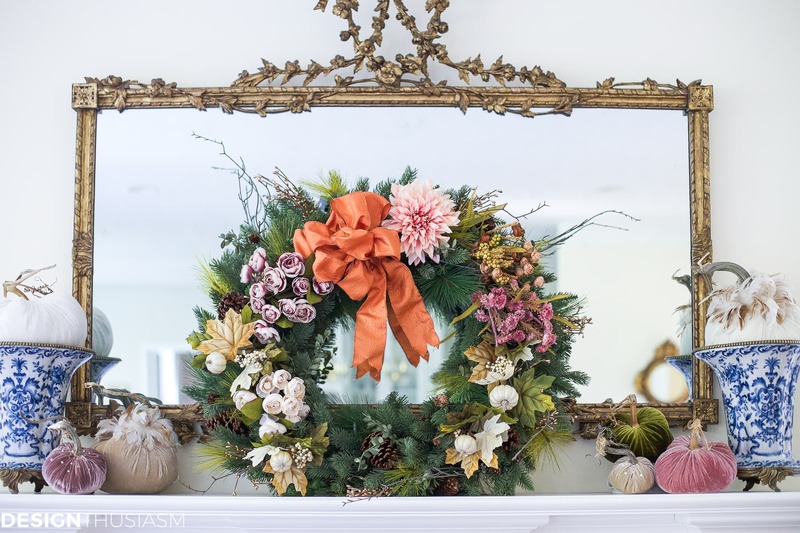 Lory, the elements that you added to the wreath are gorgeous! 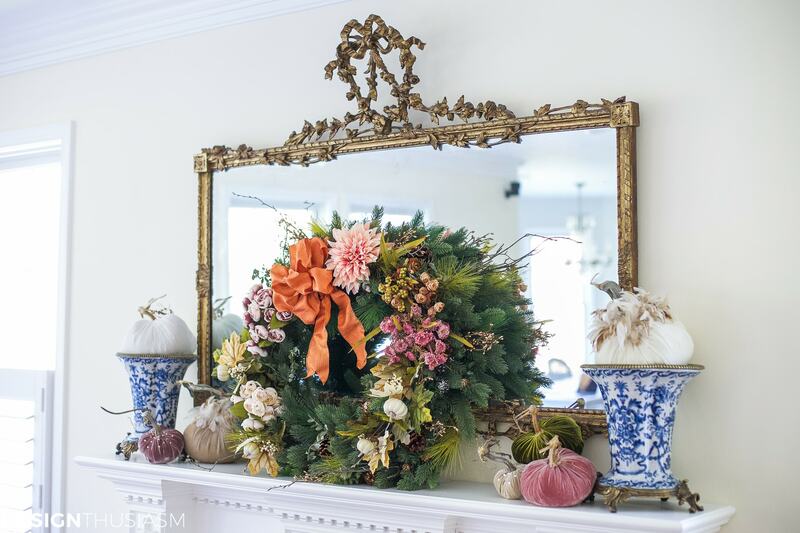 Loved seeing how you gave the wreath and garland touches of Fall! Thanks so much, Cindy! This was a fun one to work on, wasn’t it? 🙂 I thought your use of the wreath was genius!! 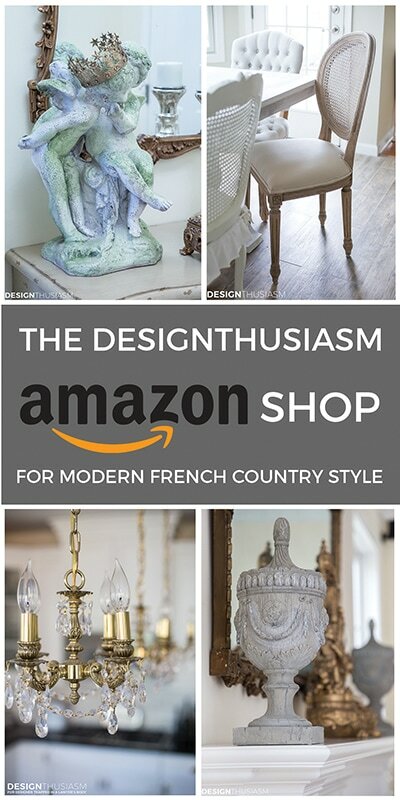 LOVE the mix of plates – would never have thought about that!!! I’ve really been enjoying seeing conifer greens mixed in with fall florals, even by wedding designers, and these look great. 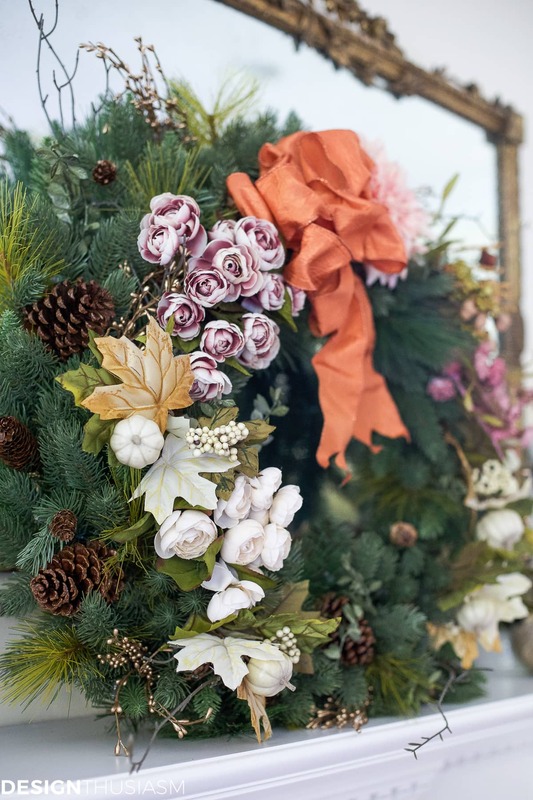 One trick I learned from a professional floral designer when using any wreaths made of faux winter greens is to just tie or twist two pieces of the existing greens around the stem of a pick to keep it in place if the wreath is going to be in a high traffic area such as a door. 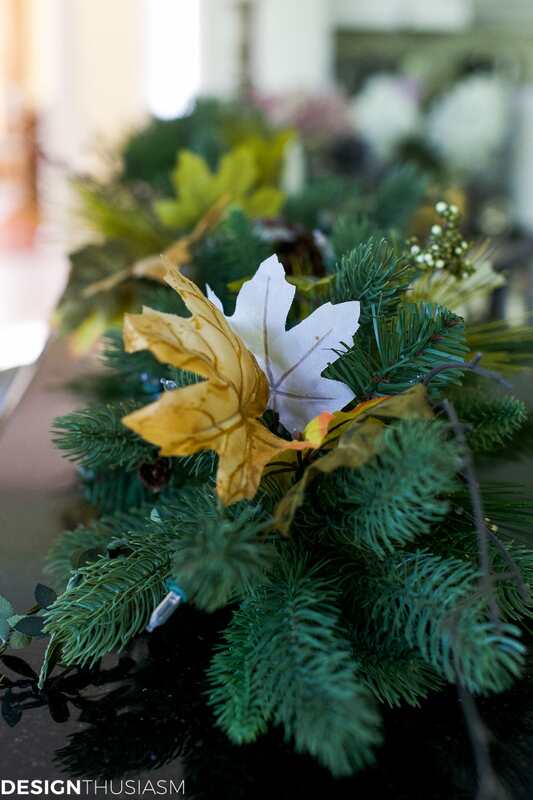 Quick and easy and no extra wire or glue needed so the picks can be removed when it’s time to refresh the wreath. Always enjoy your color combinations. 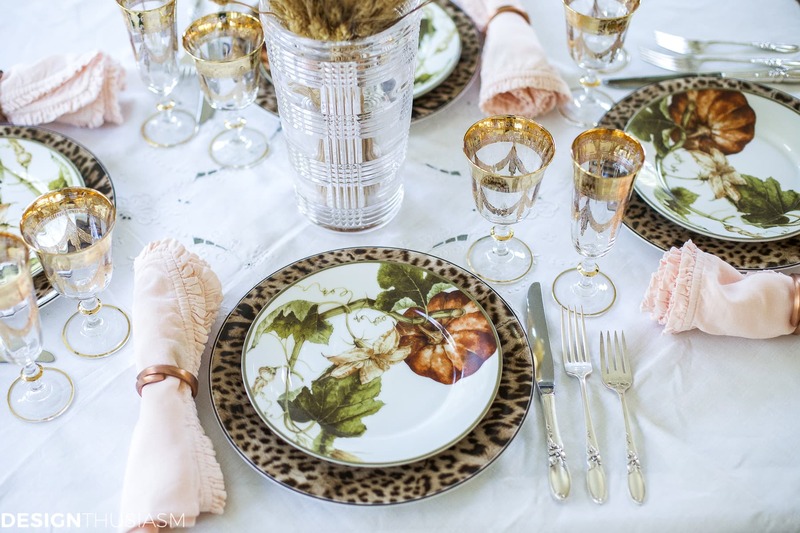 Both the animal print dinner plate and pumpkin salad plate are just giving me a fit over here!!!!!!! Gorgeous! 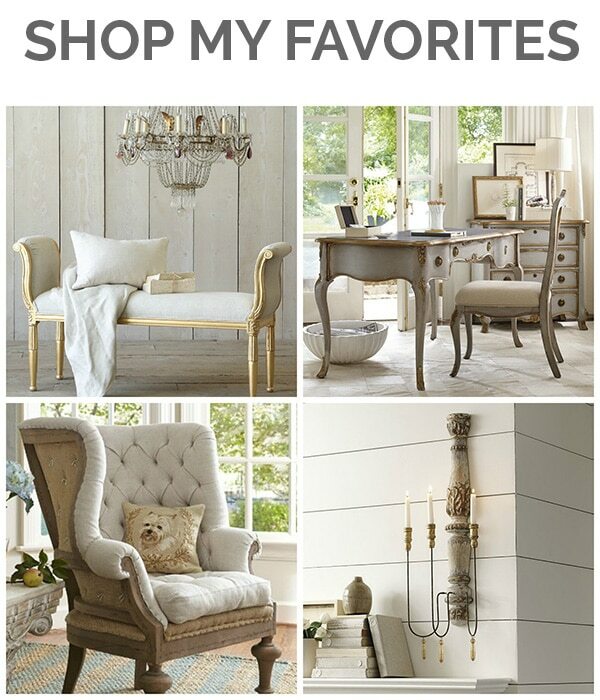 And I love how you paired them up! I think many people are afraid of mixing patterns like that, but I’m a HUGE fan!!! 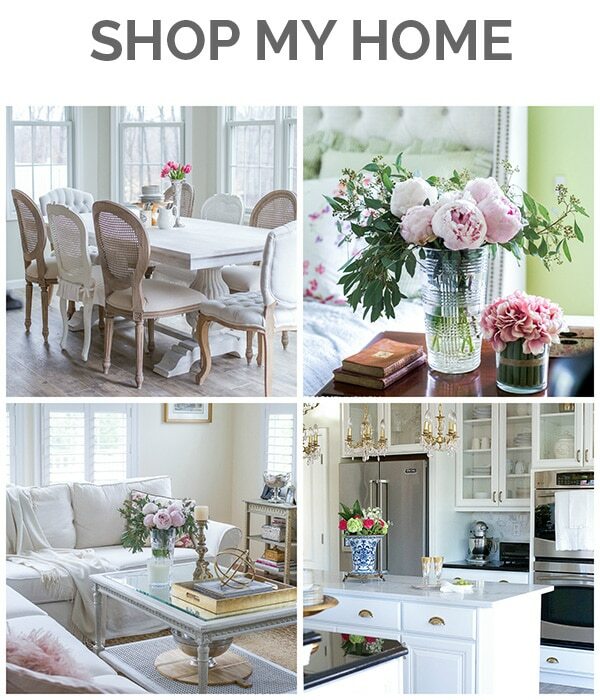 Wonderful tips on doubling down with those decorations. Smart idea, especially for people without a lot of time, energy, patience, storage space, etc.!!! Happy weekend!!! Thanks, Alycia! I think we always tend to see things the same way… 😉 I think of animal print as a neutral… lol!! Have a great weekend! Lory, you are always so original and classy. I love those salad plates but I get an error message when I try the link. Where are they from ? Love what you did with the wreath, Lory! The mix ‘n match plates are divine. 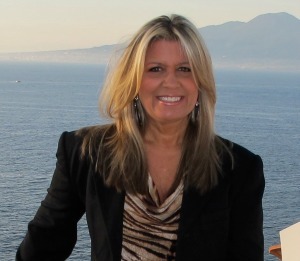 I love mixing it up and animal prints are always a winner–so elegant!